For the majority of people, a new house build is a landmark event in their lives. Years of hard-earned money and emotions, invaluable hopes and dreams are put into the building of new houses by families all across the world. At NÜHAUS, we understand this emotion and along with our thorough professional approach and outlook, this ‘human’ connection is what, we believe, makes us a leading architectural and building contractor in Dublin. From the years of working experience that we have amassed in the construction business, one thing that has always been unchanged is the anxiety and apprehension people feel while undertaking expensive projects like building a new house. That’s why, we have always strived hard to make the process of building a new house thoroughly enjoyable and exciting for you. With NÜHAUS, you will get every service you need under one roof. Right from the site inspection and valuation to architectural designs and planning; and from acquiring construction materials to imparting finishing touches to your house, we take care of everything. And what’s more, we keep you in the loop at every stage of the process so that you have a fair idea of what’s going on with your house. What does our new house build consist of? We provide full architectural design support. Our team of expert architectural designer and planners will draw a detailed plan of the building, with your consultation. This ensures that you don’t have to deal with multiple companies for the same project and thus you avoid possible planning discrepancies, legal tangles or what’s worse, compromised safety of the building. We have established great working relationships with relevant local authorities and councils. This helps us in the acquisition of various permissions and certificates for your new house build. We adhere to every applicable rule and regulation regarding safety and solidity of the building. 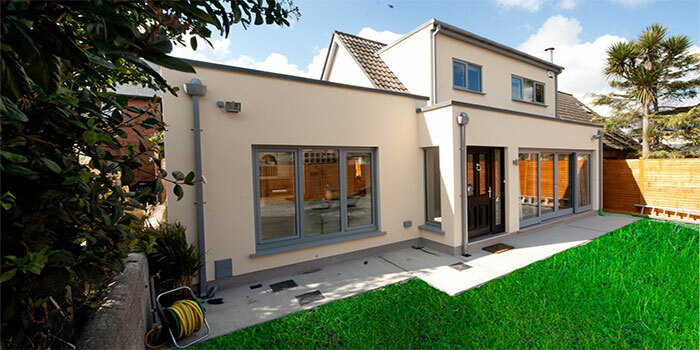 We take this responsibility very seriously and the construction material we use is of high-quality and purchased from a Irish certified supplier only. At every stage of the project, we will keep you informed and updated. This will help us take into consideration your suggestions or inputs. Building your dream house just like you envision is a task we take immense pride in completing. We make this important event in your and your family’s lives enjoyable for you. After all, it’s not just a house for us, it’s your ‘home’.